Gospel-Centered Teaching by Trevin Wax is a practical book that admonishes readers to put Jesus at the center of every lesson and sermon. Indeed, Spurgeon’s plea in the 19th century to preach the text and then “make a bee-line to the cross” is at the core of this work. The author adds, “Unless you understand the power of life transformation is in the gospel, you’ll run after anything and everything else trying to manufacture life change.” So we make it our aim to return again and again to Jesus and his gospel. 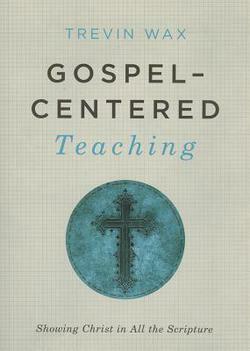 Gospel-Centered Teaching is a powerful book that reminds readers that the gospel is not merely for the unconverted. Indeed, it not only saves us; it also sustains us in the Christian life. I am reminded of the gentlemen who left a church I served in. The accusation went something like this: “I left the xyz church because all I ever heard from the pulpit was the gospel.” This person failed to see that the gospel is not only for salvation; it is life itself and propels Christ-followers into the future by his grace and for his glory. Gospel-Centered Teaching is a necessary antidote in a culture awash in moralism. This little book is sure to encourage pastors and teachers to not only maintain fidelity to the gospel; but to keep it at the center of all ministry.